I've Been Working on the Railroad - guitar tabs and chords in two different keys. Though this is a traditional and old song, don't assume your students have heard this song before. But being easy to learn, except for one surprising chord, they will be singing it in no time! Here it is in the key of G, the version that has a tricky new chord (B). Scroll down the page for the links to the free printable PDFs. You see that B major chord at the end of line three? It might stop your students right in their tracks. The A7 chord might be a new one as well, but that one is EASY. Slide up one more fret. Now the index finger should be laying across the second fret. If the rest of the fingers have behaved and stayed in place, then we have achieved a B chord! But your young students won't be happy. Unless you have been working with them on barre chords, this may be a huge stumbling block instead of a challenge! "So do you want to play the barre chord, or just the 4-string chord for now?" Laaaaa! The clouds part, and light is seen. Turns out that the 4-string chord is perfectly acceptable to them. Still not VERY easy, still not very PRETTY... but it's a start. Now here's page two; it uses just the three main chords. But because it only uses the I, the IV, and the V chords, this seems like an opportunity for a new challenge. Therefore, I ask the kids to tell me WHAT those 3 main chords will be, if we are in the key of G.
Holding up the five fingers of one hand, we count up, "G, A, B, C, D..." If G is "1", then C and D are the 4 chord and the 5 chord. Our trial run through page two is GUESSING which chords are played where, as we sing it through without the sheet music. They usually do pretty well! I like for my guitarists, even the young ones, to have an idea of how chords are built. 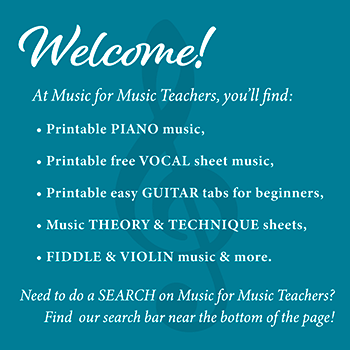 Therefore, we frequently find ourselves over at the piano keyboard or using a piano keyboard paper chart, especially when working on notereading or building chords. The layout of the piano keys is the "Rosetta Stone" for musicians. The only problem is... yes, that darned F chord. It's so hard to make it sound good! But PRACTICE makes, well, PALATABLE. Perfection will come! When I was a girl, we used to pile into the back of my grandparents' milk delivery truck and head "out the road" for a fun day at a local swim hole. Together with lots of root beer, chips, hot dogs, floatable inner tubes and COUSINS, we'd have a blast. Half the fun was singing silly songs on the thirty-minute drive out there. We'd sing "My gal's a corker; she's a New Yorker...", "Found a Peanut," and a few other favorites. I've Been Working on the Railroad was the one I knew best, and remembered all the words to!